We use the glass convex mirror and the diameter of the mirror is 7.5cm(2.95 in), which brings a wide field of vision so that you can fully observe the rear road clearly. Our products are suitable for most bicycles with a handlebar diameter of 1.8 cm to 2 cm (0.71 in - 0.79 in). The total length of the bracket is 21cm(8.27 in) , the brackets and mirrors are both support to 360 degree rotation adjustment, so it can bring you a good experience. ★With the rearview mirror you do not have to turn around to clearly understand the situation behind. ★Flexible Rotation: The bracket and mirror can be rotated 360 degree depending on your needs. ★More Clear and Broader: Using a glass convex mirror with a diameter of 7.5 cm(2.95 in), you can see clearer and broader. 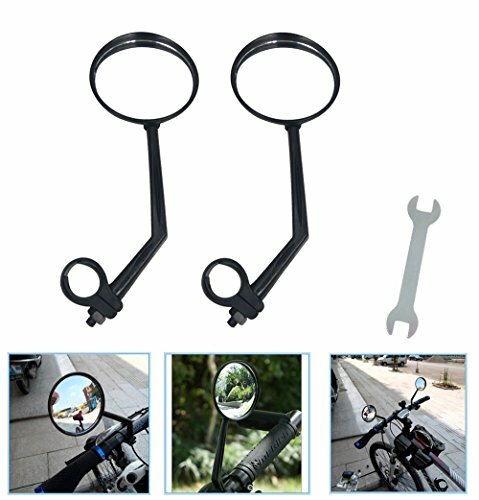 ★Suitable for Different Bikes:Suitable for Kids Bike and other types of bicycles with the bicycle handlebar diameter is 1.8 cm to 2 cm (0.71 in - 0.79 in). ★Easy Installation: You can easily tighten it to the handlebars with the small spanner we give away, and the 360 degree Rotational lens can be used on left or right sides, you need not to distinguish the sides when installing. If you have any questions about this product by ZOSEN, contact us by completing and submitting the form below. If you are looking for a specif part number, please include it with your message.